Michael Dunlop celebrates victory in the Senior TT in 2016 with runner-up Ian Hutchinson (left) and John McGuinness. Isle of Man TT outright lap record holder Michael Dunlop will be aiming to hunt down his two main rivals in the Superbike and Senior races this year after retaining his starting position of number six. 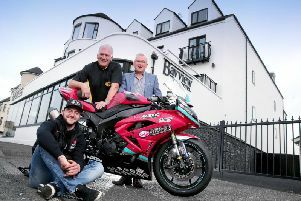 The Ulster rider, who completed a double in the showpiece races in 2016 and set a new outright lap record for the Mountain Course at 133.962mph, will set off 20 seconds behind Tyco BMW’s Ian Hutchinson (4), with Honda Racing’s John McGuinness moving to number five this year in the biggest change to the seeded line-up. Dunlop, who also became the first rider in TT history to complete a lap in less than 17 minutes last June, will ride the all-new Bennetts Suzuki GSX-R1000, while McGuinness is also entering unchartered territory on the new CBR1000RR Fireblade SP2. The Morecambe man has previously raced with the No.1 plate every since 2011, with the exception of 2013 when he carried number three in a tribute to the legendary Joey Dunlop. He last rode at number five in 2002. Between them, McGuinness, Hutchinson and Michael Dunlop have amassed a staggering 50 TT victories and their close proximity to one another in the starting order this year will make for a fascinating showdown. Norton’s David Johnson will lead the way down Bray Hill at No.1 ahead of New Zealand’s Bruce Anstey, who will again race the exotic Padgetts Honda RC213V. Behind the Flying Kiwi, James Hillier is at number three on the JG Speedfit Kawasaki. Manx rider Conor Cummins climbs the order, swapping his traditional No.10 for the number seven plate. Cummins is due to confirm his team and machinery at the official launch of the TT in Douglas on Thursday. He will be followed by Honda Racing’s Guy Martin, who will ride with his familiar No.8 on the Fireblade SP2, while Dean Harrison (9) on the Silicone Engineering Kawasaki and Smiths BMW rider Peter Hickman – the fastest TT newcomer ever – complete the top ten. Michael Rutter (Bathams BMW) is next at No.11 ahead of two-time TT winner Gary Johnson, who is also yet to reveal his machinery for 2017. New Jackson Racing rider Lee Johnston keeps stays at No.13 and will set off from Glencrutchery Road ahead of the Isle of Man’s Dan Kneen (14) on the Penz13.com BMW, while William Dunlop (Halsall Racing) is seeded at No.15. The returning Josh Brookes is at No.16 on the second of the Norton machines, while the top 20 is completed by Steve Mercer (RC Devitt Express Kawasaki); Martin Jessopp (Riders Motorcycles BMW); Top Gun Racing’s Dan Hegarty and Ivan Lintin on the Devitt RC Express Kawasaki. Nineteen of the first 20 seeded riders have lapped at over 128mph and between them have a remarkable total of 71 TT victories and 195 podiums, emphasising the fact that the strength of depth and level of competition at the TT is at an all-time high.